The Witch tube ornament is a simple and cute idea! The Witch design is beaded around a plastic hang tube (the ones which are a lot of beads such as delicas are sold in – you may have some lying around unused!). The ornament can be opened using the top cap and items placed inside and hung using the Halloween striped hanging loop. The witch is holding a star wand ready to preform magic, as you turn the tube around a little pumpkin and skull can be seen on the ground at the back of the tube. So what should you put inside your tube? Well that's up to you! Here we have added orange TicTac sweets, but other sweets, letters, money or even beads will work! 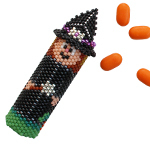 This Witch Letter Tube bead pattern is made using Japanese Miyuki size 11 Delica beads and round peyote is used. It is assumed the beader will be familiar with round peyote, however full instructions are given. Please note the pattern may not work with any other size and type of beads. There are 13 colours in total and the finished beadwork is approximately 7 cm x 2.25 cm. Additionally 1 x 8mm crystal ab and a Plastic Tube With Hang Cap 2 inches x 9/16 inch is also required (available from www.threadabead.com - our ref: 939) The bead pattern supplied is 14 pages and includes a colour chart of suggested delicas, a colour pattern and a numbered coloured pattern.